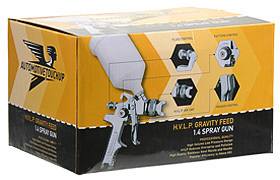 This HVLP gravity feed spray gun is intended for the do it yourselfer who demands a low price. It comes with a 1.4 spray nozzle/tip uses HVLP technology, and comes complete with a 600 ML plastic paint cup, cleaning brush, and a tool for disassembly. Air operating pressure is 29-50 psi, average air consumption is 6-11 CFM.